I have great faith in Manjushri. I have always had great faith in Manjushri and the much needed benefits He bestows upon practitioners. His practice can bring so much benefit to the person by increasing their memory, learning, composition, absorbing the Dharma, teaching, poetry, and much more. There are many forms of Manjushri which are depicted in different colors, two arms, four arms, peaceful and wrathful forms. Each form has a special function. 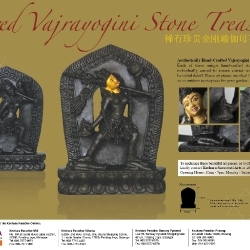 A very good friend of mine, Dato’ Eric Tan has recently offered me a beautiful 9 feet four-arm Manjushri statue carved of stone. This form of Manjushri is very rare and Dato’ Eric has made special arrangements for it to be carved. This four-arm Manjushri holds in his right hand a fiery sword, representing that he cuts asunder all causes of suffering. 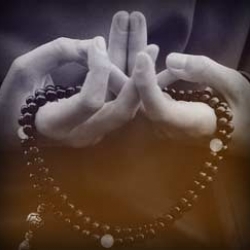 His left hand he holds a pure lotus flower by the stem in a teaching mudra. A scripture text sits atop the blooming lotus represents Manjushri’s stainless wisdom and his loving vow to teach us. His other two hands hold a bow and arrow representing wisdom and skilful means in union to bring benefit to people. Our team has arranged for this Manjushri statue to be enthroned on a special made platform on Manjushri Hill overlooking the valley to bless the people and surroundings in Kechara Forest Retreat (http://retreat.kechara.com/ ). The Green Team did a very good job making the surrounding area of the platform beautiful with bamboo and white pebbles to give it a Zen look. As soon as the statue was placed on top of the platform, a group of students who were working out from Manjushri Hill prepared offerings for a special puja to enthrone Manjushri and a beautiful rainbow appeared in the background to the right of Manjushri. I was told that the rainbow was visible throughout the duration of the puja together with a constant drizzle. Both the drizzle and rainbow stopped when they completed the puja. Very auspicious omen. It is a very auspicious omen as the light rain and rainbow appeared throughout the puja as we believe that the land deities and spirits residing in the area are very pleased also. 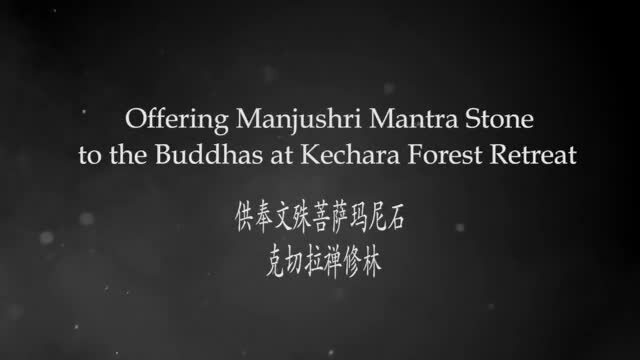 With the installation of Manjushri, I wish to bless all those who come in touch with Kechara Forest Retreat with the blessings of wisdom and the Dharma so that they will be able to attain peace and happiness. I would like to share these with everyone so that you may all be blessed. Harnessing up Manjushri to be moved. 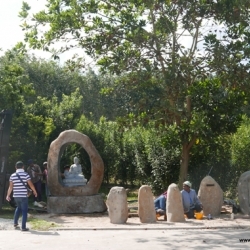 Arranged for the statue to be moved to the Zen garden. Manjushri’s implements being fixed onto the statue. 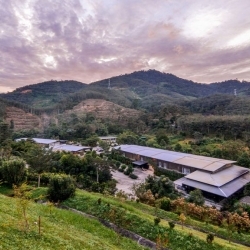 Panoramic view of the 4-arm Manjushri at Kechara Forest Retreat. Manjushri in a beautiful Zen garden. A rainbow appeared, together with a light drizzle, during puja after Manjushri was installed. Another clear picture of the rainbow that appeared during the puja. Kecharians did a short puja to enthrone Manjushri. 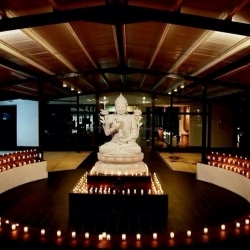 Another beautiful picture of the 4-arm Manjushri at KFR ( http://retreat.kechara.com/ ) ! Huge Dzambala Retreat Starting April 23rd…get involved!!!!! TAMING OF THE SHREW!!!! Performing Arts & KSK!! KMP’s Young Writers Blossoming!!!! Getting Bigger!!! 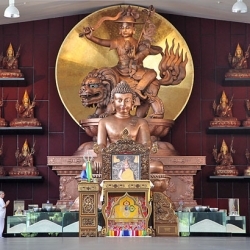 38 Responses to Kechara Forest Retreat’s Manjushri! 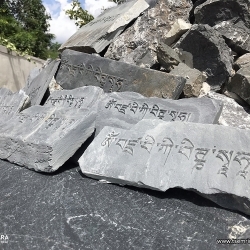 I would like to share with you the sacred prayer of Manjushri – A Concert Names of Manjushri (’Jam-dpal mtshan-brjod, Skt. Mañjuśrī-namasamgiti), which consists of 160 verses and mantra sentences. One version is translated by Alexander Berzin, a scholar, translator, and teacher of Tibetan Buddhism, and the other one is from FPMT. Very beautiful Lord Manjushri statue. Thank you Dato Eric Tan for offering this statue to Rinpoche and we are all so fortunate to be able to make offering and do circumambulation there. 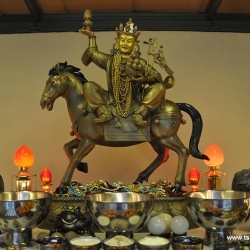 May the land of KFR, Bentong and everyone be blessed by Manjushri. One can’t help but admire Manjushri at KFR, it overlooks many places due to its elevation very similar to Manjsurho overlooking the sufferings of sentient beings. Thank you for sharing these pictures of Lord Manjushri being installed on top of Manjushri Hill. The statue is stunning and it really stood out from the greenery surrounding it. Manjushri practice is really important because our mind is clouded with the darkness of ignorance. The sword manjushri is holding can cut throught our delusions that arises from ignorance. With his practice, we can gain wisdom and insights into Buddha words and texts. His practice is crucial to attain enlightenment. Dear Rinpoche thanks for sharing these beautiful photos of Manjushri Statue. I havent got s chance to see it yet but from what i heard and read its such a beautiful Statue..I will visit it some day to see it myself.May all be blessed by this beautiful Manjushri Statue at KFR. This is a stunning Manjushri at Kechara Forest Retreat. To be able to set my sight upon Manjushri is such a great blessing and I hope more people are able to receive this blessings. May all have the wisdom and clarity of mind of Manjushri. OM AH RA BA DZA NA DHI. 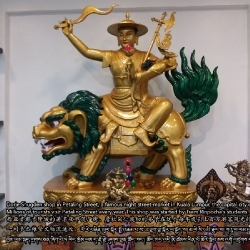 Before I join Kechara, i did hear about manjushri name but not really interested to know details.Today, I learned a lot about Manjushri especially many deities in Gelug lineage is emanation of Manjushri. I did visit Manjushri Hill (MH) twice and I can feel tranquility and calmful at that place. MH is a higher place so I can view on wisdom hall, dukkar apartment and many vegetables farms as well.It is greenery view. This four arms Mansjushri located just nice on top of MH. I can feel that she is bestow us wisdom and skill in order to help us to do dharma work and benefit others. Thanks Rinpoche on Kechara Forest Retreat(KFR) conceptualization. This is the dharma center for us to learne and practice dharma. I always love the statues all over the Kechara premises. They just look so exquisite perhaps due to Rinpoche’s magical presence and blessings. And this particular lovely Manjushri statue is breathtaking too. Homage to the buddha of wisdom. More power to you Rinpoche 🙂 Rejoice at the merits of Kecharians involved in the puja offering to Lord Manjushri and installation. Amazing post as always. Really a very beautiful Manjushri Statue. Hope that this Manjushri will bless all the animal around Kechara Forest Retreat and bring world peace ultimately. wow, the Manjushri statue looks amazing and beautiful. i have seen the statue and it just fits in perfectly with the environment. KFR looks amazing now and i cannot wait to help out next time. Very beautiful magnificent 4 armed Manjushri. May every sentient beings nearby be blessed by Manjushri! I rejoice for those who put up the statute is amazing and very beautiful manjushri . Thank you Rinpoche for posting these pictures. Indeed, a very Beautiful Manjushri Statue, Thank you Dato Eric for making this statue available in Kechara Forest Retreat, thousands of beings in Kechara Forest Retreat got the blessing of Manjushri is because of you. The Manjushri is seated at a very good location, once we go in, we can see him on the hill, how blessed we are to be able to work under the blessing of Manjushri. Wow! 9ft Manjushri statue is so beautiful! Dato’ Eric Tan is so lucky to be sponsoring such a magnificent statue of Manjushri, he must be so happy to have been able to sponsor and be a part of it. May he collect all the merits and safety of him and his family. It is so auspicious to see a rainbow during the puja, its such a magnificent view behind the Manjushri statue. I love the touch of the bamboo sticks surrounding the statue with white pebbles. May it bless the land and the local deities. 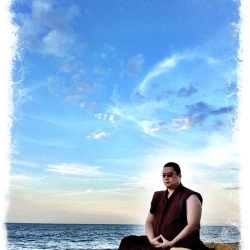 Thank you for sharing these beautiful photos with us Rinpoche. We are very fortunate to have a very special person here in Malaysia which He tirelessly giving teaching after teaching about Dharma. 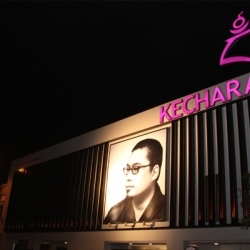 Without Him there will not be Kechara today and there will not be the existence of Lord Manjushri in one of the particular hill in Bentong, Pahang. Who would imagine this could happened here in Malaysia. Thank you Rinpoche for making this happened and thank You for all your hard work with much patience explaining the Dharma to all of us and making us realized the importance of Dharma in a person. If i may i would say without Rinpoche’s clear and profound teachings we will still be in a dark not knowing much about Dharma and will be just an ordinary Malaysian treating religion as a custom rather than practicing the Dharma. Thank you Dato’ Eric and the Green team for making this happened, all the sentient beings will be blessed by your actions. With folded hands, Thank You to my Guru Tsem Tulku Rinpoche. OMB!!! 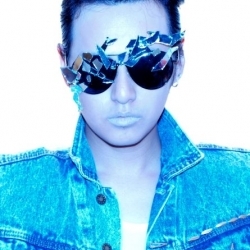 Is tremendously beautiful!!!! Love him soooooo much 🙂 May all sentient beings blessed by The Lord of Manjushri! Om Ara Baza Na Dhi! Beautiful!!! The platform, the composition of surrounding which the Manjushri seated now look very surreal especially the picture with the rainbow behind. May all be blessed by Lord Manjushri!!! Thank you Dato’ Eric for making this happened and The Green Girls for designing such a wonderful lanscape in order to have such an impact when the photos is taken. I just cannot believe where I am today. I do wonder what good did I do in the past to be able to create this cause for me to be here today in this magnificent place… to be working here in Manjushri Hill surrounded by the breath taking view, amazing good spiritual friends who like family. A surreal, peaceful environment, and most importantly to be working so close to my Lama! It all seems like a dream… to be able to work in such a conducive environment where you sleep Dharma and you wake Dharma… 24hours we do Dharma. We have a purpose, a goal and it is far greater than the self, far greater than the “I”! This is what life is suppose to be and I could never imagine going back to the draggy, samsaric life that is aimless and empty. After all you’ve eaten, partied, all the money made, lovers made, babies made, grow old then what? What next? Definitely a no no for me…. seems to boring, too too empty and depressing. So I am very happy, blessed, fortunate and grateful for where I am at today. Dear Rinpoche, this 9 foot statue of Manjushri is really beautiful and He looks very happy. Last week when I went to KFR to help out, I saw this Manjushri on the platform where Manjushri is seated and the view behind Manjushri is just beautiful, I love where Manjushri is seated. It’s just so pretty, Manjushri and the view. With the rainbow, the view looks even better. I’m so glad to know that there were auspicious signs on the day of enthronement, Lord Manjushri looks really beautiful. The Zen Garden looks very nice too, Lord Manjushri is surrounded with all the greens. May Lord Manjushri bless the surrounding beings as well as the projects happening at Kechara Forest Retreat. Wow, this is amazing. To have such a nice statue up at KFR to bless everyone and its surroundings 🙂 i wanna see this statue now. And i love where it is positioned. Just in the right place where it can spread the blessing everywhere. Lord Manjushri look so splendid and majestic overlooking the valley in Kechara Forest Retreat. May Lord Manjushri bestows wisdom blessings on us! Thank You Rinpoche for sharing this post to us. The sight of Lord Manjushri at KFR is just magnificent.I would like to thank the Generosity and effort of those who made it happened to benefit and blessed all sentient beings who are fortunate even to have a glimpse of this magnificent statue. OM Ah Ra Pa Tsa Na Dhi ! 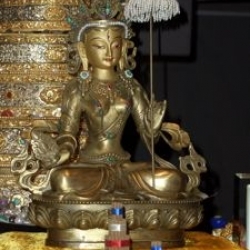 Very beautiful 4 armed Manjushri statue! Om Ah Ra Pa Tsa Na Dhi! 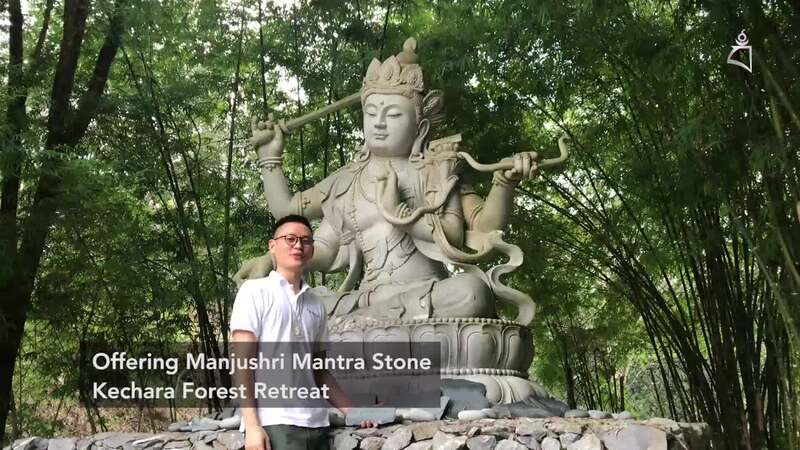 Manjushri Hill is really a special place, you will not how peaceful it is at night, no noise, no horns, no traffic, all we have here is just cool air, nice air and gentle breeze on your face. I’m sincerely Thanks Dato’ Eric Tan’s family that get this place for us. I’m wonder what have I done in my previous life, that I have the merit to work here, to live here, to enjoy the view here ? People is chasing over money, fame, power, status etc everyday but i can actually just sit down and do my Dharma work. All this are from my kind teacher, Tsem Rinpoche, Rinpoche planned everything for us, brought everything for us and make sure we are fine. 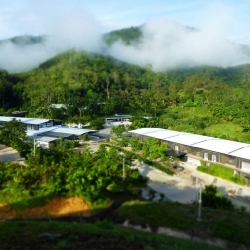 May whatever work I do will bring benefit to many, and may all people who step in Kechara Forest Retreat will have a peace of mind. May I never ever separated with Tsem Rinpoche and Dharma, may I one day become the light of many, just like my Kind guru H.E. 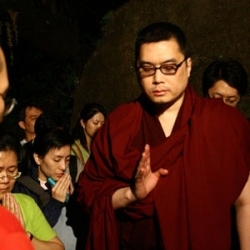 Tsem Rinpoche. What a beautiful place to place the magnificent statue! i love it! YAY!!!! Finally Manjushri is up on his special Throne and I am very happy that such nice and amazing signs such as a rainbow and a light drizzle appeared during the whole duration of the short yet powerful prayer. The Green girls totally did a good job in designing the wonderful Zen Inspired Garden Throne. Totally can’t wait to see it with my own eyes! Om Ara Baza Na Dhi….